Raw Cat Food - Coming Soon! At Wolf Tucker we have a clear vision regarding the food we make. This allows us to focus on researching and adding only the best ingredients for your dog just as nature has intended! To improve and maintain the health and well-being of canines. To provide the best possible chance for increasing the longevity and to decrease certain conditions and ailments for dogs. To help our canine friends enjoy a more natural and suitable lifestyle. To help introduce and educate dog owners to a 'whole' new way of feeding their dog. To promote the 'prevention is better than cure' approach. Provide our customers with free advice, support and the best possible customer service. We would like to embrace our passion for natural raw feeding and share with dog owners alike. It makes no difference whether your dog is big, small, short or tall, fluffy or scruffy, a Heinz 57 or a pedigree show dog! We love them all! Let us help you to make your faithful friends life happier and healthier. 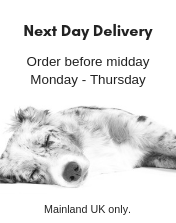 Our natural raw dog food gives you peace of mind in that it provides your much loved canine friend with all the nutrition and goodness they need for a healthy body and mind and thus lead a happy healthy life. Your dog’s diet needs to contain a balanced variety of protein, carbohydrates, fat, vitamins and minerals. On the inside you will want your dog to have strong bones, a happy gut, sharp healthy brain, organs in excellent working order and not to mention a healthy immune system! On the outside, healthy skin, coat, claws, bright eyes and energy. These are to name but a few on our wish list and Wolf Tucker aims to provide all these benefits to keep your dog in tip top condition. WolfTucker.co.uk. Safe & secure shopping. All prices are in GBP Copyright 2019 WolfTucker.co.uk.